I saw our first robin today! First of all, I’m sure you’re wondering how I came out with my stress test. I passed. It seems like I got a case of walking pneumonia out of my last nasty cough-cold and that was what was causing my chest pains and shortness of breath. (The doctor looked at the first X-ray but didn’t see the light consolidation that was already fading, but the radiologist spotted it.) Anyway, I’m feeling better and so is Will. Come on, spring! 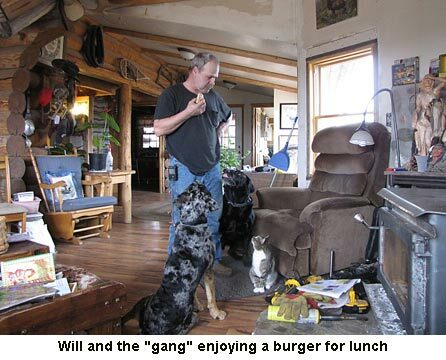 Every time Will has a hamburger, Spencer, Hondo, and Mittens crowd around for bits of the bun (and maybe a little meat). So I just had to post a picture of them. I think it’s so cute! Today has been busy. I’m starting our first tomatoes, canning hamburger, and had to run to town this morning. But while I was in town, I saw a robin, our very first. I even backed up to make sure! Luckily, there was no traffic in town. Yesterday I saw three geese at home and Will also saw a pair of swans. So thankful that there was not a heart problem. Take good care of yourself. Nah. He does give the babies some pieces so they wait (mostly) patiently. Wow, 60 turkeys in one flock! I wish we had wild turkeys here but no go. Maybe in the future? When I lived on our farm in Sturgeon Lake, we had VERY few wild turkeys. We and a neighbor raised some for release even. Today, my son, Bill, regularly sees them in his woods and even beneath his bird feeder in the yard. One can hope…. Hey, don’t get too jealous. I’ts supposed to get down to single numbers tonight. But then warm up to the high fifties. You’ve got to remember that because it gets so cold up here that even fifty seems like summer sometimes! We’re greatful for every single sunny, warm day, especially this time of the year. Glad to hear you’re on the mend. We were down for a few weeks this winter, no fun. Also jealous about the green grass and short sleeves, we still have plenty of snow cover and it’s snowing now. Hope spring comes soon. Glad you’re on the mend!!! Glad to hear your tests went well. I agree with Rick. Very jealous about the no snow and short sleeves. We continue to get snow almost everyday lately. I think more than the whole winter and it isn’t melting. Ugh! I have gotten a little crazy with the seed planting in the house so I really need spring to hurry along. The animals must know they have a little treat coming from Will if they line up like that. I’m glad you are both feeling better as well. That is a nice load of wood.You are ahead of me with spring,I haven’t had any robins here yet. Maybe today…with an inch or two of new snow. The animals must know they have a little treat coming from Will if they line up like that. I’m glad you are both feeling better as well. That is a nice load of wood. So happy to hear about the stress test! Hope you’ll be back to 100% soon. Glad spring has landed for you two. Love the pics of Will’s adoring fans. 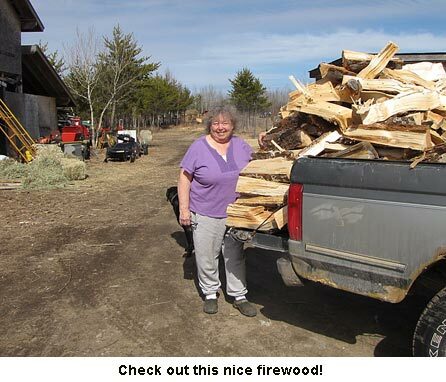 Nothing warms the heart like a truckload of firewood! Never thought we’d say, “Hooray for pneumonia.” Glad you are recovering and looking forward. Thank goodness for the checkup results. Not only do we have more robins than we can count, my grand daughter and I saw almost 60 wild turkeys in one bunch, and a quarter mile down the road, a red fox. It was the most miserable skinny looking creature I’ve seen in ages. I’m betting it was trying to reach the turkeys and my car scared it the other direction. My dad and I were saying that the Bradford Pear trees in our area are the most beautiful we have EVER seen. Spring is definitely here, just wish I could say that about the last frost date. Doesn’t Will feel the least bit like a tease, standing there eating in front of all those woeful eyes, poor babies, lol! I’m so glad to hear of your good stress test results. You’ve had enough setbacks, I’m thinking, and we need many more years of your wisdom and inspiration. I have had walking pneumonia for weeks. Finally, I went to the doctor, but the congestion is hanging on. The birds are so loud in the trees. it is such a happy sound. So glad you passed your stress test. I know you must be relieved. Thanks for all you do to share your knowledge with others. Spring is here in south Louisiana. Spending hours each day getting everything planted. Love the hamburger picture. Last week while at the clothes line I saw geese headed in your direction. Lots of robins here and more flights of geese daily. May 15 to June 1 for our last frost date so we’ve a way to go. Glad to hear you’re on the mend. Dh & I both are just recovering from the crud going around and dh got pneumonia with it. So glad you are ok and Will too. You both live a very full life going full speed. Nice to see you are both back in the groove . Hope you are the mend! That’s a nice load of firewood. Well, if you’ve spotted a Robin as far north as you live, Spring must be on it’s way!